Social media can bring people from the farthest corners of the world together in an instant. This ability to transcend any border is what makes it so special—and powerful. For a business looking to effectively reach a global audience on social media, it unfortunately takes a bit more effort than simply logging in and saying hello to the world. Whether you have main social media accounts that you publish both international and local content from, or different accounts dedicated to different regions entirely—here are some key steps to reaching a global audience on social. Do some digging into the demographics of each major social network to confirm whether or not the audience you want to reach uses them. This will ensure you invest your time and money where it counts. Click Add Stream in your Hootsuite dashboard. Select the social profile you’d like your search to be based on (i.e. select your Twitter account if you’d like to search Twitter). Enter a hashtag, a phrase, or your brand name in the search query field under the Search tab. To change it, enter in the coordinates of the place you want to target. You can find these by using Google Maps. Whether they’re direct competitors or not, analyzing other businesses who are already doing a good job connecting with an international audience on social can be a huge source of inspiration. Check out our step-by-guide for conducting a competitive analysis on social media. Surveys are an easy way to ensure the data you’ve collected about your international audience is accurate. SurveyMonkey has a specific template for researching your audience on social media that you can use to help answer which social networks your audience prefers and their content preferences. Some countries have different parameters for marketing activities that can apply to social media campaigns. Check with your legal department before launching a new social media campaign to ensure it complies with the region’s legal requirements. During your research, you may have noticed a pattern in the type of content being consumed and shared the most in your target regions. Guess what? That’s the type of content you’ll want to make more of. Along with taking cues from what’s working already, here is some more advice for creating content for an international social media audience. There will be some conversations you’ll want to have with your entire global audience on social media, and others that are specific to certain regions. Keep track of both by creating one social media content calendar and using different colors to label your global and local posts. An easy way to find content opportunities for different regions is to log in to Twitter Analytics and select “Events” from the top bar. You’ll see a list of upcoming holidays and events from around the world, and the demographics of the people who will likely be talking about them on Twitter (and other social networks). Depending on the region you’re targeting, localizing your content could range from changing the spelling of a few words or switching up an image, to translating your posts into a different language entirely. Either way, taking the time to adapt your content to these regional differences will help create trust with each audience. Unfortunately, you won’t be able to reach every time zone on social in real time unless you deprive yourself of sleep on a regular basis. The easiest way of overcoming this is drafting posts in advance and then using Hootsuite to schedule them. Ensure the dates and times you’ll be scheduling messages is reflected in your content calendar so that you can identify any gaps. 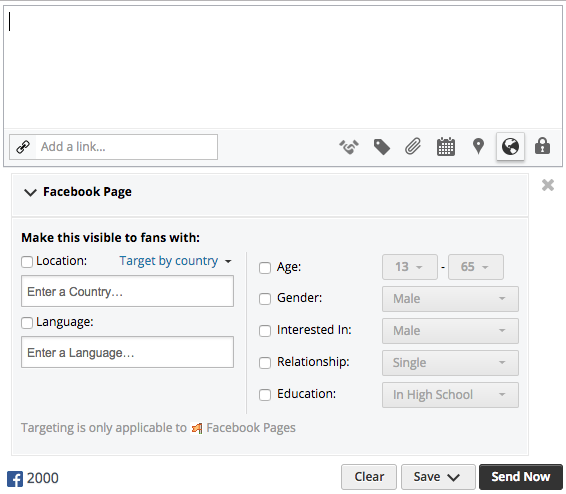 Using Hootsuite, you can geo-target any post to a Facebook Page or LinkedIn Company Page so that it’s only shown to your audience within a specific region. To do so, simply click on the globe icon in the Compose Box and enter the region you wish to target. Scheduling posts in advance can help you reach a global audience, but it won’t help you have a real-time, one-on-one conversation with those people. Since teleportation still isn’t a thing (thanks a lot, SCIENCE) you might need someone else to help with engagement so that your followers don’t have to wait a full day or more to get their questions and comments answered on social. Choose your helper and have a meeting with them to discuss your expectations. Clearly outline their role and responsibilities, and give them a copy of your content calendar, engagement strategy, and style guide. Overcome any skill gap by pointing them towards Hootsuite Academy. They can take free online courses in social marketing and gain confidence in using the Hootsuite dashboard. If you have a Hootsuite Enterprise or Business plan, set this person up with limited permissions so they’ll be able to post on behalf of your brand while you maintain control and keep your social networks secure. Hootsuite can help you grow and manage your global social communities all from one place. Try it free today.